Kung Hei Fat Choy ! 恭喜發財 ! 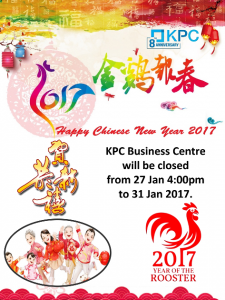 We take this opportunity to wish you and your family has happiness and prosperity Chinese Lunar New Year 2017! KPC Business Centre will be closed from 27 Jan 4:00pm to 31 Jan! Next story Why start a business in Hong Kong?